So when I first heard there was going to be a spin-off series from Vampire Academy, I said to myself "Self, after you finish 'Last Sacrifice' you need to move on with your life and not spend time pining over Richelle Mead's next book". And I had just about convinced myself to follow through, but after the ending of 'Last Sacrifice' and finding out I would get heaps of Adrian in this book, I couldn't keep away. I love me some Adrian Ivashkov. And I was definitely intrigued by the focus on Sydney. She was a little uptight at times in the VA books, but I was really interested in the ideas behind the Alchemists and the lives they lead. 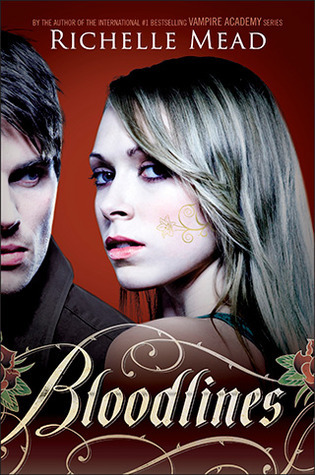 So here I am having just finished reading 'Bloodlines' and I am not disappointed. And let me tell you, Ms. Mead sure knows how to work a cliffhanger! We have Adrian all over this book, which was complete awesome! He was still good old Adrian, most of the time, but actually see some growth and dare I say maturity start to develop in him. I certainly won't mind continuing on his journery throughout the rest of the 'Bloodlines' series. I still feel like Sydney is a bit too uptight at times, but you see some major changes in her in this book, too. We don't really know too much about her going in, and it was cool to have the book be from the perspective of an outsider to the vampire community. She knows they exist and all that, but she doens't really understand them and definitely isn't too fond of spending much time with them. Although, that starts to change throughout the story, too. I'm so glad Eddie got to come along in this one. I always loved him in VA and he doesn't let us down here. Extrememly loyal and willing to go to whatever lengths needed to help someone he cares for. I sure hope Eddie gets some well deserved happiness in the upcoming books. The only things I didn't like about this book was all the attraction to Jill. It seemed very random, and a little bit unrealistic that all these older guys would be falling for her at the same time. Also, how easy the plot twists were to guess or figure out. But of course it didn't bother me enough to ruin the book! I loved this book! I was so happy to see Adrian return in a different storyline, after what happened with Rose. I loved this book. VA was one of my favorite series. And Bloodlines did not disappoint.